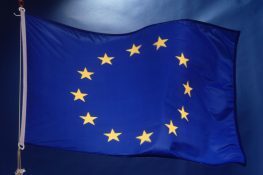 Below we have listed all of our motorhomes for sale. 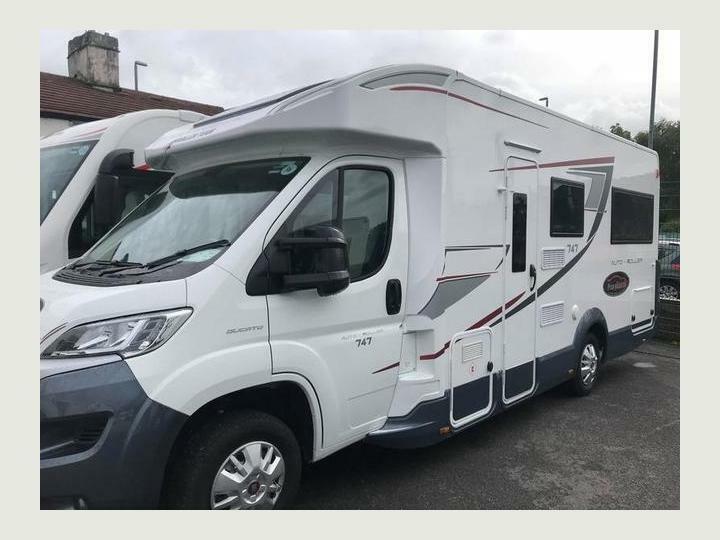 For more details on each motorhome, you can view our motorhome hire page to see additional images and specification information. 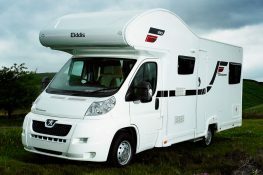 To enquire about a motorhome simply call 01254 386 090. 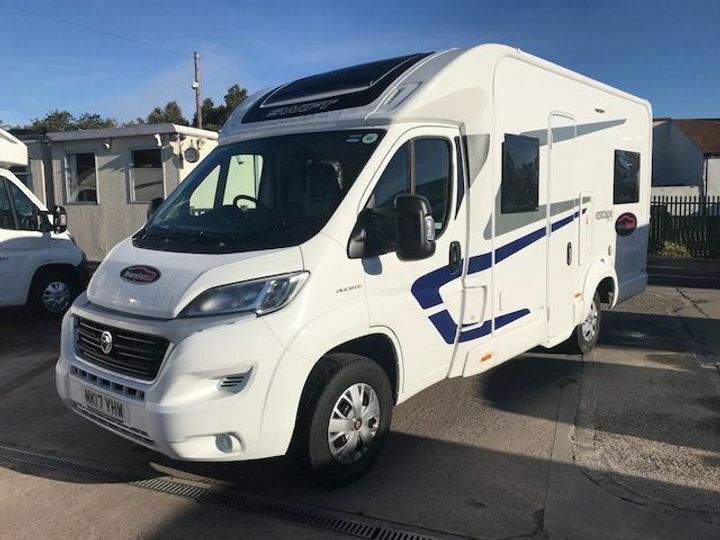 The Pegaso 740 is a high spec A-Class 4-berth motorhome featuring near-side habitation door. Rear bedroom features a luxurious height-adjustable rear island bed. Uses a Fiat Ducato 2.3-litre 180bhp MultiJet engine, Driving aids ESP and Traction+ come as standard. 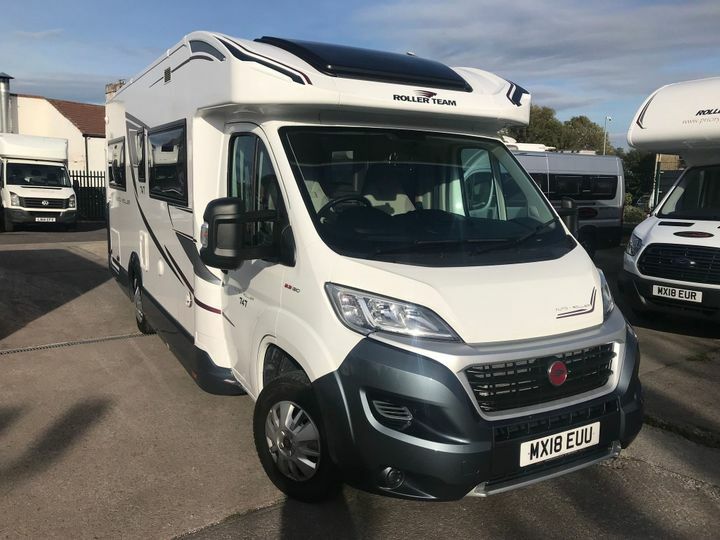 There’s a 95Ah AGM leisure battery, electrically operated and heated mirrors, cab air-con, cruise control, TomTom sat nav, colour reversing camera and 16in alloys. Up on the roof you get a 120W solar panel while in the kitchen there’s a three burner, gas hob, an oven and grill. The three-way fridge/freezer has a large 150-litre capacity. Water capacity is 120-litre for fresh and 110-litres for waste. For heating you get the 6000W combined gas heating with CP Plus. The lounge area features an L-shaped dinette with two extra seatbelts, and there is a drop-down bed over the cab. The Roller Team Auto Roller 707 Low Line has a unique ‘double L shaped’ dinette lounge with twin rear bunks. The lower bunk can be stowed away to create a large storage area accessible from the outside, ideal for bicycles or larger items. There is also a fantastic electric drop down double bed behind the cab, above the L shaped dinettes which all together offer sleeping for up to 7 people. The Roller Team Auto Roller 746 boasts a spacious 6ft rear U shaped lounge for 6. The lounge is ideal for relaxing after a busy day and can easily convert in the evenings into either two singles or a large double bed. To the middle there is a well equipped modern kitchen and washroom with separate shower cubicle. 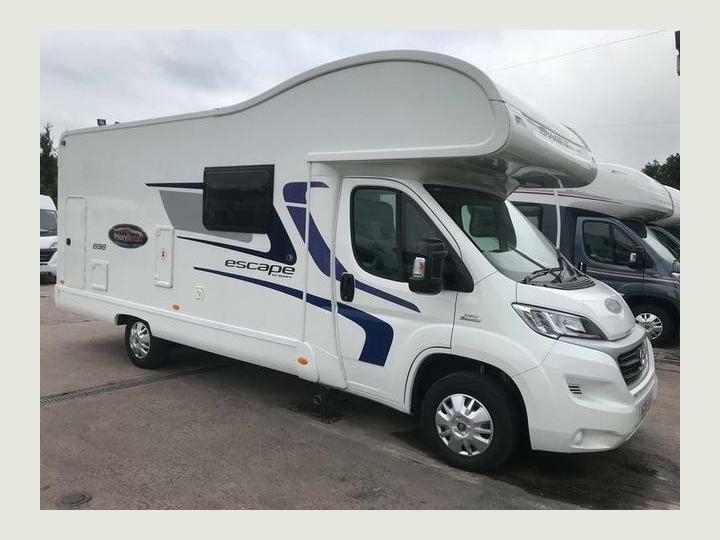 This motorhome comes with the “DRIVERS PACK” Parking Sensors, Digital Aerial & TV Bracket… Roller Team Zefiro 690G. 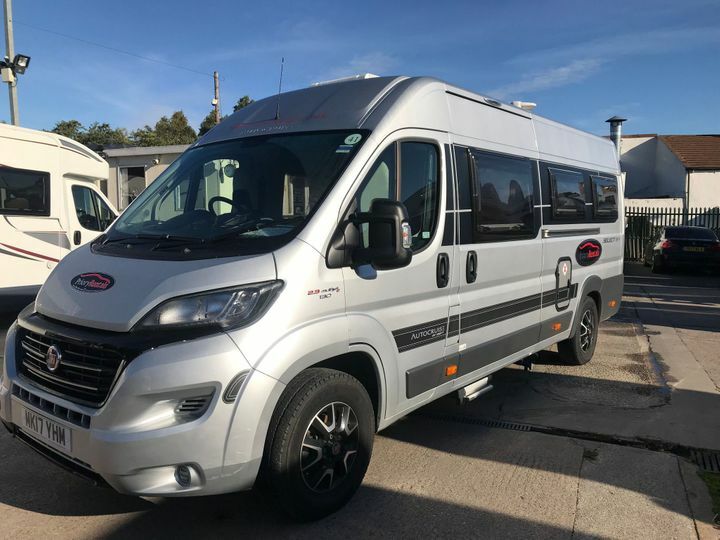 Designed with comfort at it’s forefront, this spacious motorhome can comfortable sleep and feed up to 6 people at any given time. A converted over cab area frees up floor space during the day while concealed storage throughout allows the home to stay as stylish as possible – even on the longest of journeys. 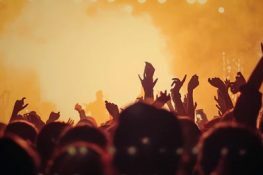 A large washroom and separate shower cubicle reducing time wasted while getting ready as well as offering privacy to every member of your party. With wooden panels and high-quality soft furnishings throughout, the 690G provides that home-from-home feeling with Hill Start Assist technology ensuring the smoothest of pull offs in any location. 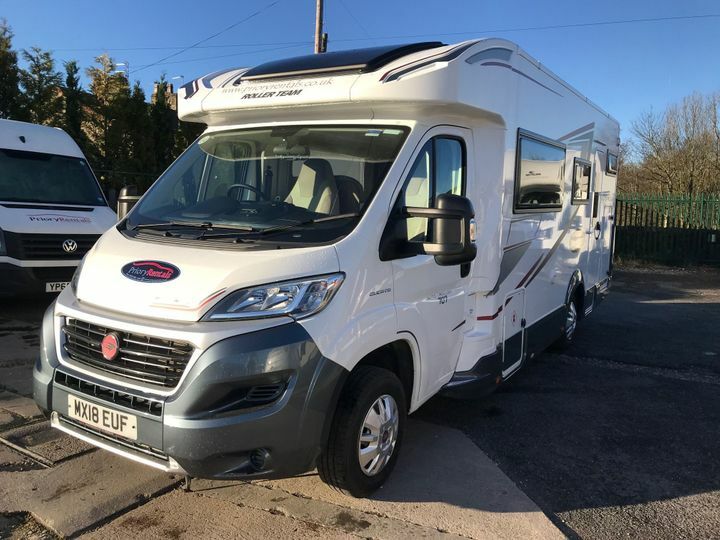 Excellent for families with children, this 6 berth hi-line motorhome offers a comfortable place to relax on holiday. For a great night’s sleep, the 675 includes 2 double beds, with a large over cab bed and twin rear bunk beds. If you don’t need all three beds, the bottom bunk bed can be easily stowed away creating a large storage space ideal for bicycles and sports equipment. The dinette has enough space for six people, creating a space perfect for family meals. 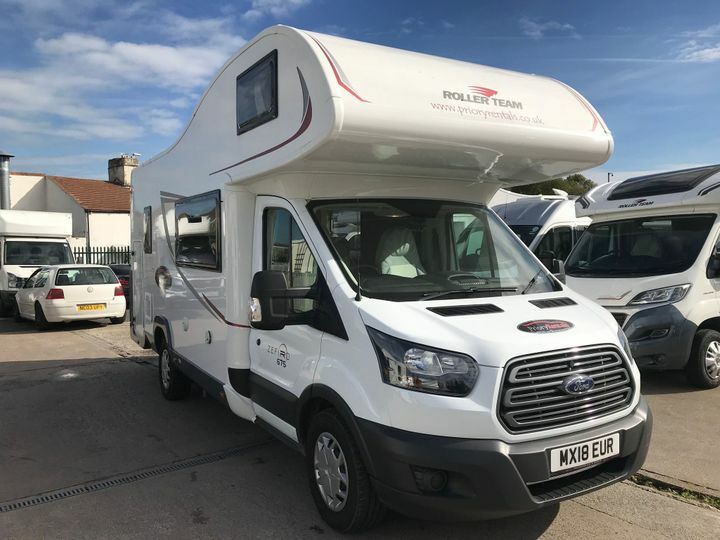 The 694 model offers a spacious rear corner bed with large storage area below, wardrobe and en-suite washroom which features Thetford electric flush toilet, overhead lockers, washbasin with built-in cupboard and the luxury of a separate shower. The kitchen is central, equipped with three burner gas hob, stainless steel sink, grill/oven, large fridge with separate freezer compartment and storage areas including overhead lockers, cupboards and drawer. To the front is the lounge area, with side settee and forward-facing dinette which has two seatbelts and can be converted into a double bed if necessary. Other models available call for more information. The Swift Escape 696 can comfortably sleep six and is spacious enough to do so with ease. Fiat Multijet Diesel Engine 130bhp 2.3 6 speed manual gearbox Cab air-conditioning Fully integrated Radio/MP3 player Electric windows Electric entrance step with automatic drive-away retraction Remote central locking of cab doors and immobiliser with rolling code Thermal cab window covers Lap and diagonal seat belts on all designated passenger seats Secure positive catches on all furniture doors Combination thermostatic oven and grill with electronic ignition 230V sockets 300 Watt charger/transformer for 12V supply 70 amp-hour leisure battery in exterior access locker 65 litre internal fresh water tank with level sensor 68 litre waste water tank with level sensor Microwave Other Models available. 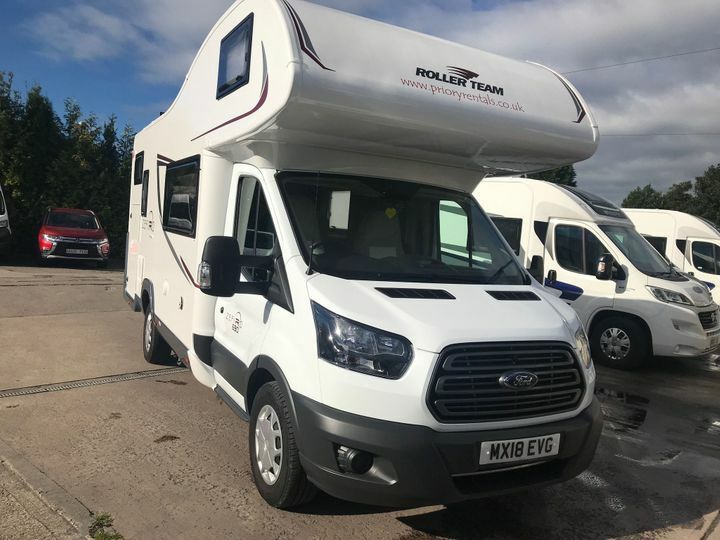 The T-Line 785 is a revised layout for 2016 This model offers twin longitudinal rear single beds with the possibility of joining them to form a double bed, storage is complemented by wardrobes under the beds and steps. Also at the rear is the full width en-suite washroom with separate shower. To the front is the lounge with side settee and L’shaped dinette with two forward-facing seatbelts. In the evenings sleeping is offered by converting the dinette into a single bed plus the electrical elevating bed above that can be positioned at any height. The practical kitchen is central, featuring a 140 litre fridge/freezer, 3 burner hob and grill/oven. 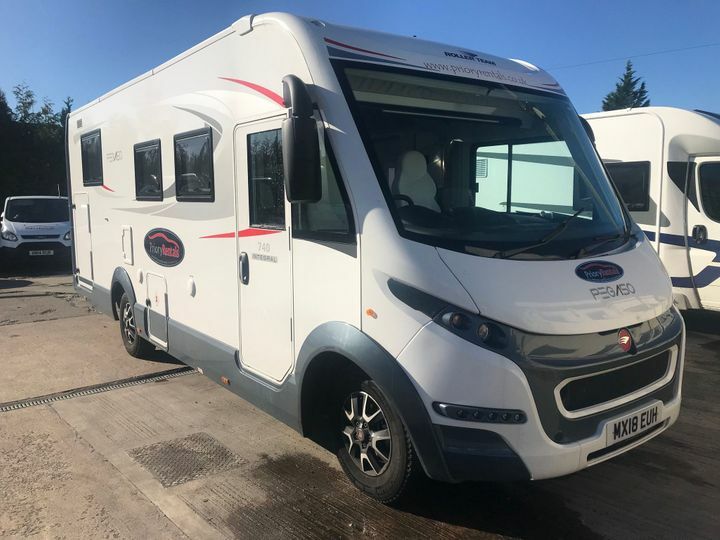 The Swift Escape 664 is built on a 2.3L 130bhp Fiat Ducato chassis and features a rear french bed layout. The cab features electric windows, electric mirrors, a reverse camera, captain chairs and cab air conditoning. 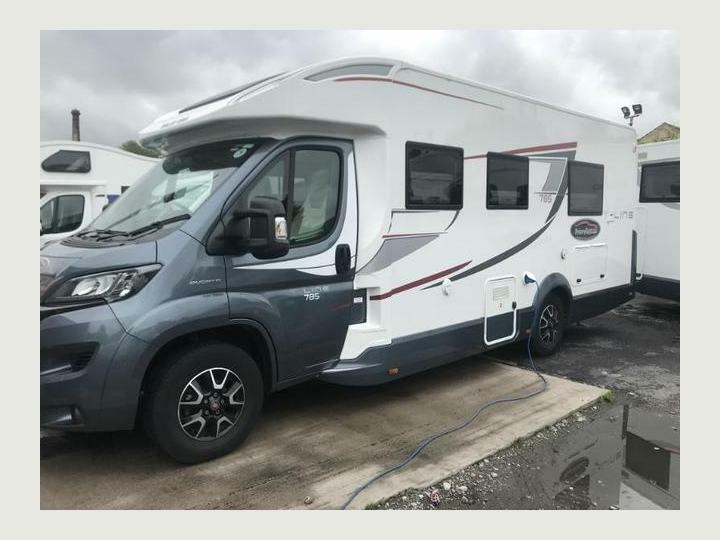 When the chairs are swivelled this creates your open dining area with two extra forward facing seatbelts and can convert into a double bed to turn it into a four berth. The side kitchen contains an oven, grill, three burner hob, three way fridge and microwave. The end of the Motorhome brings you to your rear french bed and washroom along side it. The washroom contains a cassette toilet, hand basin and shower. The Autocruise 184 you’ll find sufficient space for two people to sleep in comfort & all the modern conveniences you’d expect from any 21st century vehicle. Vogue Pack: Metallic silver paint and body coloured bumper Electric & heated wing mirrors 16″ Alloy wheels (15″ with 115bhp) LED day time running lights DAB radio and bluetooth Steering wheel controls Silver (Techno) Dash Kit Reversing sensors Vogue graphics upgrade (on top of Driver’s Pack) Soft furnishing and cab seat cover upgrade (Edison scheme) Full video of motorhome available on request. 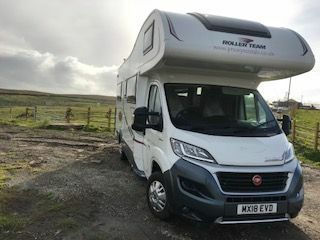 Roller Team Auto Roller 747 Low Line a UK friendly u-shaped lounge, central en-suite opposite a large wardrobe and well equipped kitchen area leading to the front where a full double dinette offering 4 seat belts so 6 can travel in total safety. Opposite the dinette is a side facing settee which opens up the front lounge area for split dining front and rear if required. To the rear of the cab area is a large electric drop down double bed. This full-size bed electrically operates with ease and houses a double mattress. The Auto-Roller 747 Lowline is the ultimate six seatbelt, six berth family motorhome, designed with budget, style and quality in mind. 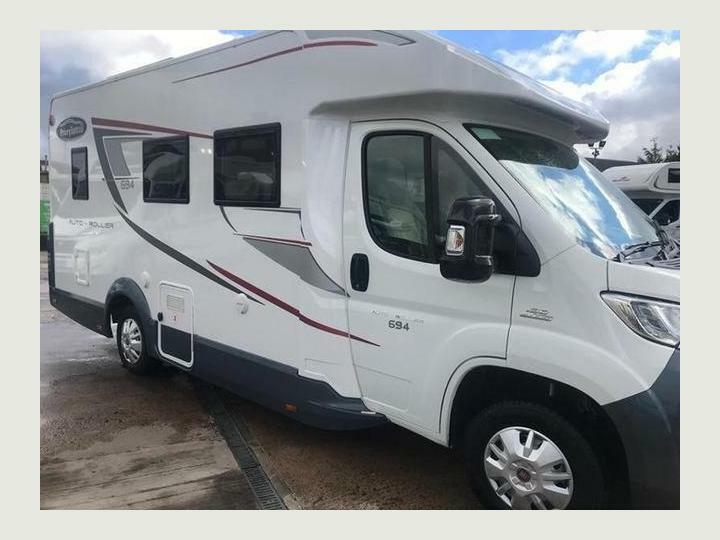 The best of all worlds are offered in this model with a UK friendly rear U shaped lounge, central en-suite opposite a large wardrobe and well equipped kitchen area leading to the front where a full double dinette offers 4 seat belts so 6 can travel in total safety. Opposite the dinette is a side facing settee which opens up the front lounge area for ‘split’ dining front and rear if needed. To the rear of the cab area is a large electric drop down double bed. This full size bed electrically operates with ease and houses a double mattress. This truly is a fantastic layout for up to 6 people offering space & comfort.